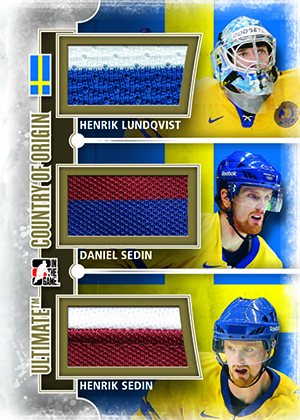 One of the company's most recognizable brands, 2012-13 In the Game Ultimate Memorabilia 12th Edition Hockey continues its high-end tradition. Every pack comes with a pair of hits. As with a lot of In the Game products, 2012-13 In the Game Ultimate Memorabilia 12th Edition mixes retired stars and high-profile prospects. While this year's NHL products can't deliver standouts like Nail Yakupov, ITG does, giving collectors something to chase while they wait for the 2013-14 double-rookie class. Other prospects in the set include Nathan MacKinnon, Jonathan Drouin and Seth Jones. Hall of Famers include Patrick Roy and Mario Lemieux. 2012-13 In the Game Ultimate Memorabilia 12th Edition Hockey boxes come with five packs. Inside each pack is both an autograph and a game-used memorabilia card. Packs also have a base card. Every ten-box case of the product comes with a Steve Yzerman Anthology Hot Pack, ensuring the Red Wings legend is well represented. These special packs have an exclusive Steve Yzerman base card, a memorabilia card of the legend and a Steve Yzerman autograph. Click here for the complete 2012-13 In the Game Ultimate Memorabilia 12th Edition Hockey checklist. 2012-13 ITG ULTIMATE MEMORABILIA HENRI RICHARD ENSHRINED AUTO JERSEY #1 1!! 2012-13 Ultimate Memorabilia Marian Gaborik Auto & Jersey Gold Card 01 01 3 Col.
ITG continues the tradition of making the ugliest overpriced sports cards ever made. ITG Ultimate is one high quality product, love the player selection, sick patches, and impressive presentation. Overall a terrific product.